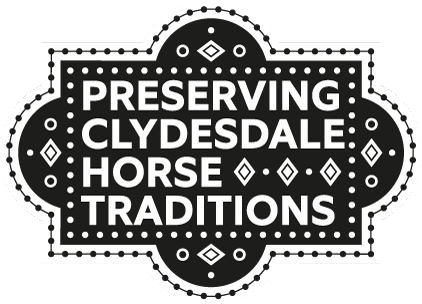 This website aims to preserve the unique knowledge and traditions of Clydesdale horse decorating, grooming and Scotch harness making. It also contains the memories and photographs of those who worked with the horses. A section on Clydesdale horse health and husbandry will be available Winter 2016 and new content will be continually added. The men (for there were few women) who originally worked with Clydesdales competed with each other for the best-dressed or best-groomed horse. Dour ploughmen would spend long winter evenings creating flashy, brightly-coloured decorations for ploughing matches and summer shows. These would be made from whatever was at hand, usually wool or raffia (aka ‘bass’), and new sets would be made each year. 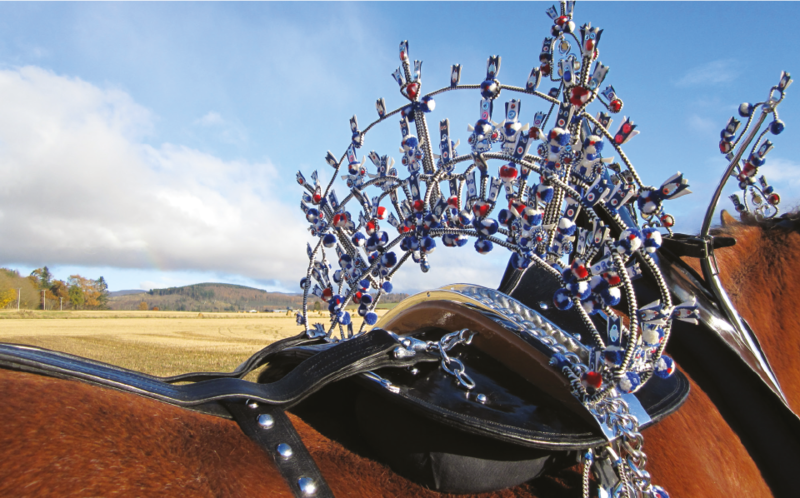 Many horsemen decorated their horses simply because they were proud of them and took pleasure in enhancing their beauty. While there are conventions regarding harness and decorations, historically these were fluid and included new ideas. Hopefully this spirit of experimentation will continue in the future. The Clydesdale horse is a large Scottish breed originating in the mid-18th century in the Clydesdale district of Scotland, now called Lanarkshire. The breed was designed to be the ultimate industrial and agricultural engine and was renowned for its soundness, power, stamina, extravagant paces and also for its grace, intelligence and ability to form partnerships with humans. Between 1884 and 1945 more than 20,000 breeding Clydesdales were exported to North and South America, Russia, Italy and Australia. These horses revolutionised agriculture by providing the horsepower to cultivate the British Empire and much of the draft power within its cities, towns and industries. Today the breed is associated with agriculture but it was also designed to look refined and suitable for sophisticated urban environments. 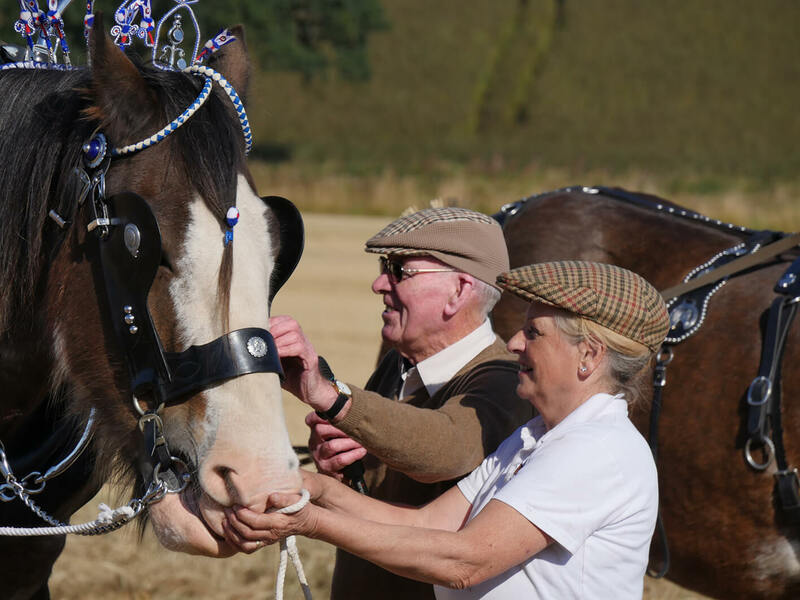 Over the last 150 years wars, mechanisation and a disease called Equine Grass Sickness have seen the Clydesdale breed designated as ‘vulnerable’ by the Rare Breeds Survival Trust with only 500-900 breeding females registered in the UK. While there is growing interest in Clydesdales as riding horses, and as a genetic component in the creation of modern ‘warm blooded’ sport horses, the future of the breed is uncertain. As a consequence, the associated unique traditions of Scotch harness-making and Clydesdale harness decorating and grooming face imminent extinction. The remaining few who have these skills are now in their old age. This website preserves their knowledge for future generations. Unlike ‘true’ native breeds that are refinements of indigenous horses, such as the Highland Pony, the Clydesdale was genetically engineered to create the ultimate multi-purpose industrial engine of its day—a high-maintenance ‘machine’ that required specialist care to keep it in good working order. Many modern Clydesdales are even larger than their ancestors, standing over 18hh (6-feet or 1828mm) at the withers. Their increasingly huge size, slow growth, heavily feathered ‘fleshy’ feet, large brain and diminishing UK gene pool stretches equine genetics to unchartered dimensions—requiring additional care and maintenance. 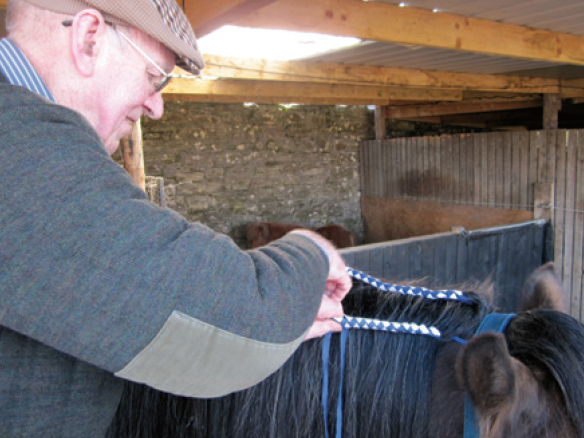 Clydesdale care includes specialist grooming, foot care and farriery, nutrition, husbandry and training. Many old practises, including those that maintained feet and feathers, have been ‘lost’. New enthusiasts, and vets unfamiliar with this rare breed, may not be acquainted with its common problems resulting in welfare issues and high foal mortality estimated to be around 20% in Central Scotland. I have Clydesdale horses that I ride and drive. I am passionate about the breed and its history and traditions and I strive to be a good, progressive horseman. I live in South West Scotland and I work as a designer. This project was inspired by Simon Alston, the last of Scotland’s original Clydesdale horse decorators. Simon inspired me to find a way to ensure his skills were passed to future generations of horsemen. I am grateful to have secured a small amount of grant funding and support for this project to record, preserve and share the unique Scottish traditions, skills and knowledge surrounding Clydesdale horses. This project is sponsored by my own business Graven and by the William Grant Foundation. 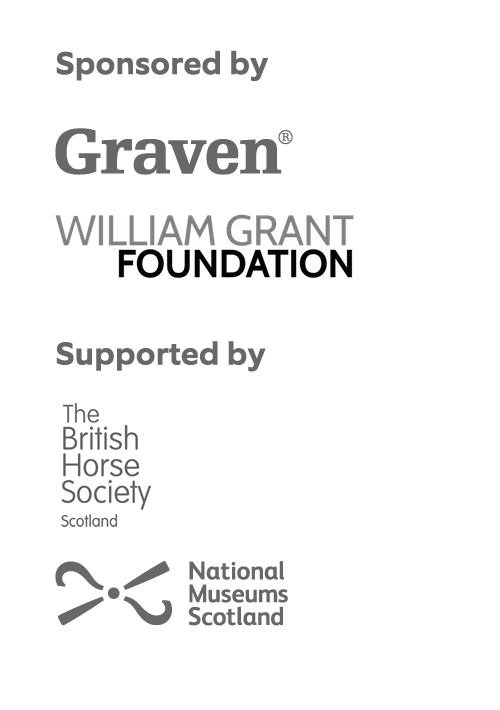 It is also supported by the British Horse Society and National Museums of Scotland. These organisations do not profit directly from the project – they support it because they care that knowledge and traditions are not lost. Information collected during this project has been edited into short films and PDF-format downloadable sheets that can be viewed free of charge. Some of the resources, including Simon Alston’s harness decorations and Jen Roy’s sample details for Scotch harness-makers, will also become part of the permanent collection of the National Museums of Scotland where they will be references for future makers. My huge thanks to all who contributed to this project. Interviews were kindly filmed and edited by Jan Nimmo, a designer and horsewoman, originally from Campbeltown and now living in Glasgow. All contributions have been credited where possible. Thanks also to Geoff Martyn from Buchanan Drive for helping create this website. I will continue to add to this resource in the future as material becomes available. Above: Simon Alston from Falkland, Fife with Isobel Duncan from Balmalcolm Clydesdales. Simon is the last Scotch harness decorator and the inspiration behind this website which passes his skills to new generations. Top right: Simon demonstrating ‘diamond row’ plaiting. 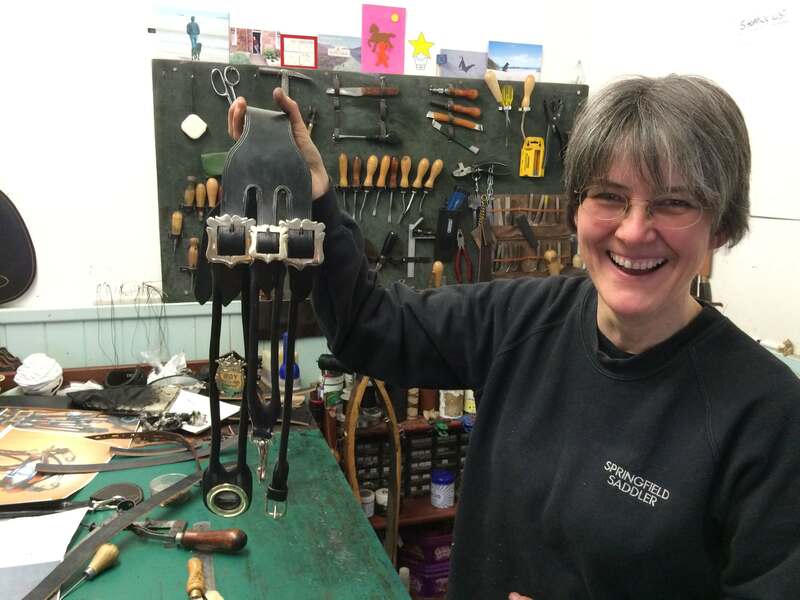 Right: Jen Roy the Springfield Saddler with a bespoke copy of a bridle by Baird of Alford.